DUKK Men's Black & Grey Crew Length Cotton Lycra Socks (Pack of 2)@319 Rs [Mrp:-549] - Onlinedeals.discount - A leading product discovery website. Find the true prices of products, read reviews and buy top brand products at reasonable prices. 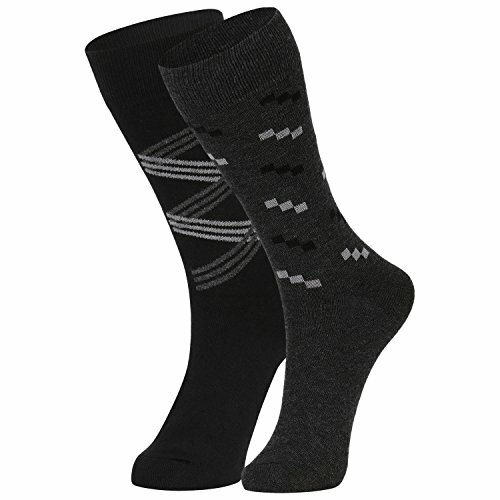 Enhance your mens wardobe with this pack of two black and grey crew length socks from internationally available brand DUKK. It is knitted in fully computerised knitting machine with an auto welt. It is made from super combed cotton and lycra material. It has 72% cotton, 23% lycra and 5% elastic. It has imported elastic for better self gripping properties. For longer use it is better when washed in water which is 40 degrees and lesser that too by hand. This product is best dried in shade to maintain its color. One need not iron or tumble dry it.